Discussion in 'Modding and Hacking - Consoles and Electronics' started by williamgentry, Jul 24, 2017. I Saw this ebay listing, i cant tell if its a hardware mod, anyone else seen this? I like too know too. never saw this sort of chip. 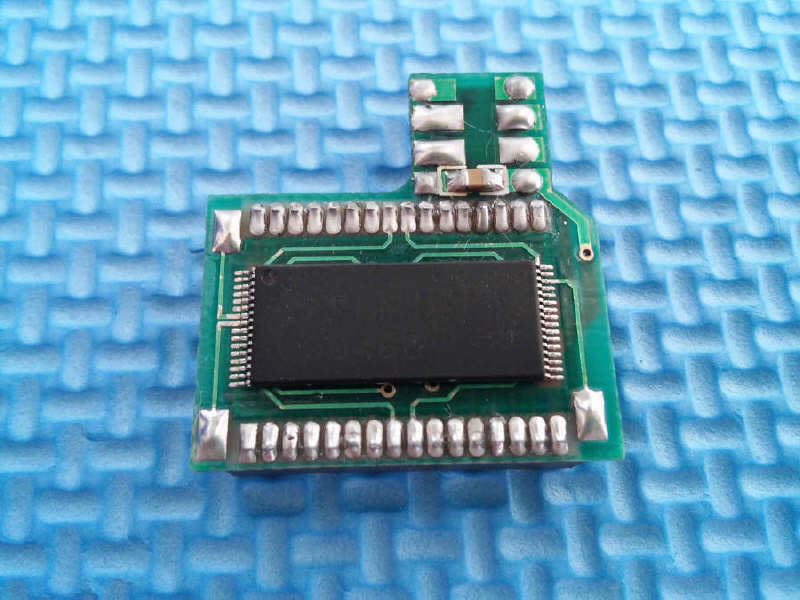 Is this piggybacking the stock BIOS chip or do you remove the stock BIOS chip and solder this in it's place? The diagram shows the mod board already in place. It has a socket that clips over the original bios. Does anyone know where you could find the alternative bios? How does C/E work though? Lets work out the connection points of the flash? Would be quite cool having sicklebricks Unirom BIOS running on one of these in a PSone. Connection points are easy, its just the data sheet of any flash the correct size and voltage vs pinout in the psone schematics. You would probably find it easier to remove the existing bios than find sockets to fit though. As mentioned above, the only point of interest on the original is how they are disabling the original bios, I'm guessing the flash chip is a am29f040 in tsop 32 and pin 30 is /ce, which is wired to the pad g and the sockets is high. But doesn't matter if you just remove the original anyway. Are they disabling the original BIOS? I though that AR type carts just mapped into some address space, and when the PSX BIOS detects a certain header it boots the code thats there. 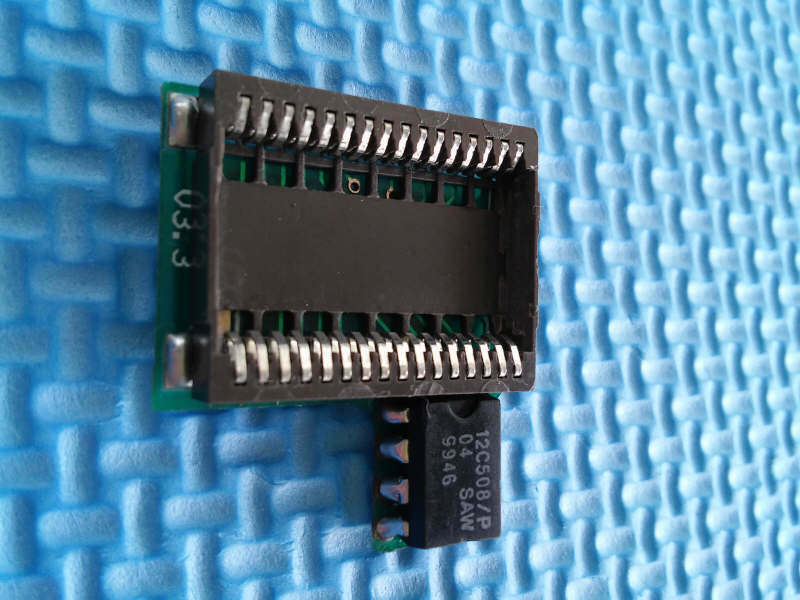 I have a VCD card that uses a similar approach to the above, it basically piggybacks the BIOS ROM to gain access to the sub bus and has a few more wires for power/ WE etc..
EDIT: Looking at an AR/GS schematic, the address/data lines run straight to the expansion connector. The OE/CE/WR lines run through the GAL/PAL. On the above it would seem.. Point G goes to C/E, Point F to Vcc and Point E is W/E. On my PSone at home (PM-41(2)) that test point looks different to the PM-41 pictured. What would W/E connect to on the CPU? Would you need W/E ? That sounds more plausible than what I was thinking.. I thought maybe it was pulling a certain pin high to get the PS1 to boot the external ROM.. There is a seperate CS line for the expansion ROM which is used.. I have half done this already, just needs finishing off. Basically the BIOS ROM uses CS on CPU Pin 97, and the Expansion ROM uses CPU pin 98. W/E is used for writing to the Flash isnt it? In the eBay listing about there is a link to a video of the above solution being flashed using X Flash.. so I assumed W/E will be needed to flash the ROM for instances when a blank is fitted or it needs updating. Never seen this mod before. Interesting.